This fish originates from dark rivers in South America from Venezuela to Paraguay including the Paraná rivers as well as the Amazon Basin in Peru. Little is known, however it has been speculated that the male's eyes are more towards the top of the head, while female's eyes may be closer to the front of the head. It has also been rumoured that while courting, both the male and females white part of the tail may glow red. A nocturnal hunter, do not keep with smaller fish such as Neon Tetras. Black Ghost Knifefish are best kept one Knife to a tank. It is said that because of the electrical signals they give off to hunt, these can interfere with other Knife's signals in a confined space and lead to problems. They can also sometimes be territorial and pairs may often try to dominate one another. They are otherwise peaceful towards similar sized and larger fish, but should not be kept with aggressive fish or those that may fin-nip or bully the Knife. Is a micro-predator of insect larvae in the wild as a juvenile. Will take frozen brine shrimp, small earthworms, bloodworm and meaty frozen foods. Almost always rejects flake foods. May eat smaller fish with it's deceptively large mouth, when it gets big enough. Twice a day. Will allow hand feeding. Prefers to be fed after lights out. Well filtered planted tank with a sandy substrate. Needs excellent water quality. Prefers a dimly lit area, so floating plants are probably required, and caves and large tunnels are also appreciated. Nocturnal. Timid with others. Will eat small fish and inverts. Dislikes its own kind so do not keep with other similar type of fish. Will stay at the bottom during the day and likes hiding places, provide plenty of large caves and hiding places, but will be more active and swim all over the tank at night. Laterally compressed flat, knife shaped black body. The majority of the the fish is black, with the exception of a white streak down the forehead, as well as a white mark under the chin, for most specimens. All Black Ghost Knifefish have two white bands around their tail. 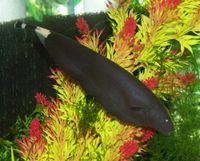 The Black Ghost Knife is a very distinctive fish and can generally not be mistaken for another species of Knifefish.